It’s almost time for me to head west for a couple months, but this weekend I had some events to attend to closer to home. A busy weekend for sure, but a lot of fun and some good results. 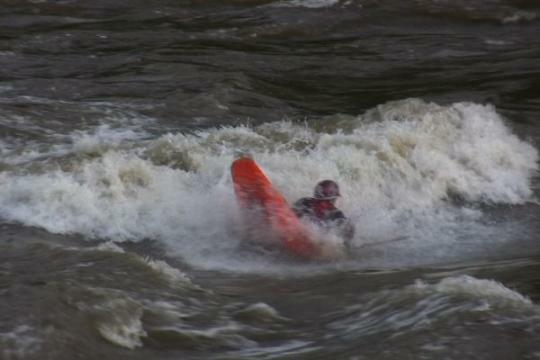 Thursday night was the first Maryland Chute-Out of the season, held on the Potomac River just outside of Washington DC. I’ve been going the Chute-outs for the past few years. The Chute-out a low-key, community freestyle series, but that’s not to say the competition isn’t fierce. It’s not unusual to see Worlds medalists in the line-up. 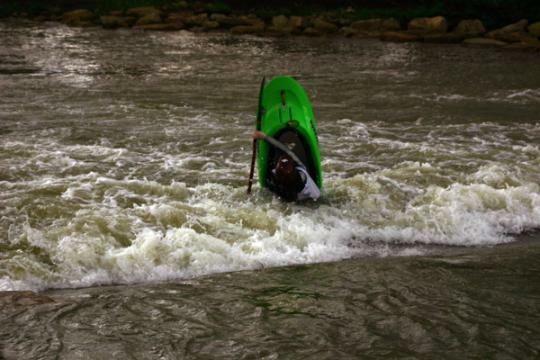 It was also the prototype event for the World Kayak Hometown Throwdown series. 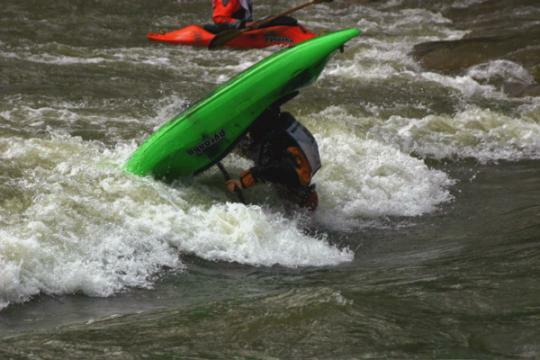 With the Potomac running well, the event was held on Center Chute wave, a bit flushy but still fun. I finished in a close second place. I’ve been really liking the Rev on this sort of feature because it’s SO easy to stick moves, and it such a great backsurfer it’s easy to set up the backwards moves. Friday it was off to western Pennsylvania for the Stonycreek Rendezvous. This is another one I’ve been going to for years, and the big excitement this year is the play park at the festival site finally got built. After checking out the park Friday afternoon, it was time for the race- three and a half miles, mostly class 2, perfect for the Speeder. Matt Samms and I lined up for the start in our Speeders, along with another Speeder, a Wavehopper, and a wildwater boat. Coming off the start was like boatercross in 4.5 meter boats. Less that half an hour later, we had a Speeder sweep, I finished first and Matt was a close second. Saturday was another big day- Boatercross in the morning, Rodeo in the evening. The boatcross went off well, paddling playboats through the Showers rapid. 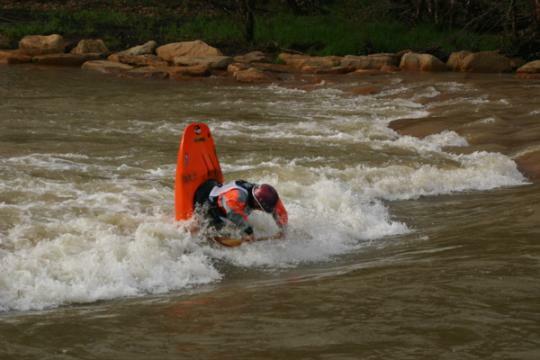 I finished third after passing for the lead around the last bouy in the final round, but then not being able to make the fast line to the finish. After that and a run down the Canyon, it was time for a quick nap and then the Rodeo.Â It was really cool holding the rodeo right at the festival site, meaning lots of spectators. The hole is a bit shallow in the greenwater coming in, but deep under the foampile, and retentive enough. With the right technique and placement, loops, cartwheels, mcnastys and the like are all possible. 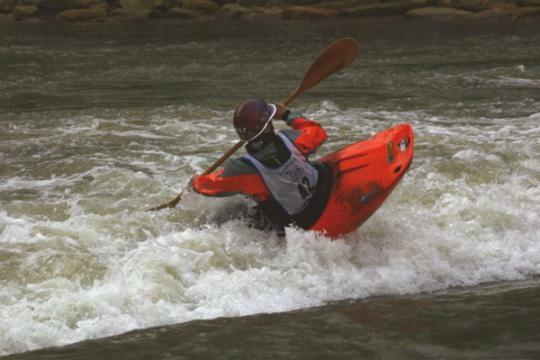 In the Women’s class, young Shelby Stine paddled her small Rev to a 3rd place finish. The men’s competition was tight, but I managed to entry-move, loop, cartwheel, and McNasty my Rev into the winning position. People keep asking my how I like the Rev, I think I’ll let the results do the talking.Â It was long weekend, but it’s a great start to what’s going to be a great season for me. 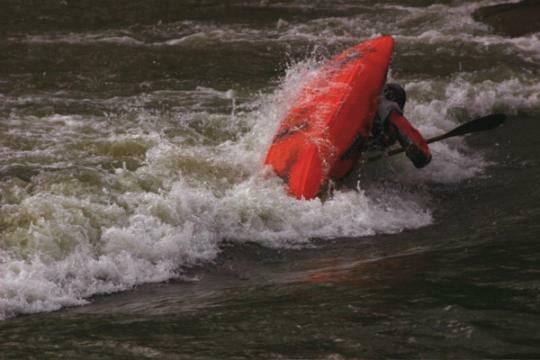 Shallow hole looping method- sneak that short bow in behind the rock.